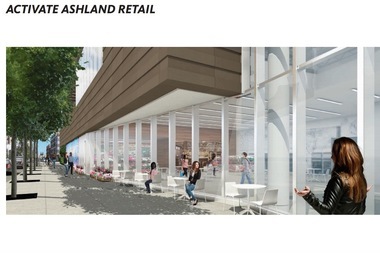 New renderings for a proposed Whole Foods at 3201 N. Ashland Ave. are dated from July 1 and were posted by the 44th Ward shortly before a July 7 presentation. 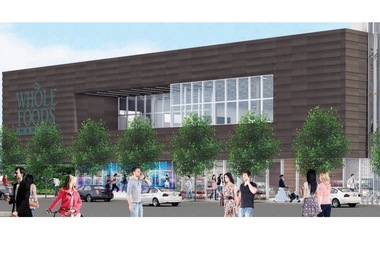 WEST LAKEVIEW — Despite lingering traffic concerns voiced by a handful of neighbors, Whole Foods got the approval Monday night it sought for a new, larger market on Lakeview's west side. After two hours of discussion, West Lake View Neighbors voted 50 to 19 to recommend to Ald. Tom Tunney (44th) the plans for a 75,000-square-foot Whole Foods Market at the northeast corner of Ashland, Lincoln and Belmont avenues. Novak Construction and Gensler design firm partnered on the project, which is expected to be completed in spring 2017. It will replace the current West Lakeview store at 3300 N. Ashland Ave. and has a 20-year lease. It will be the city's second-largest Whole Foods. Developers repeatedly returned to the drawing board over the course of eight months and a dozen meetings, tweaking designs after getting feedback from a vocal subset of the group, named Melrose Street Concerned Residents. "Can you please consider helping us maintain Melrose Street as a neighborhood street? This is something the neighbors are really concerned about and want to have, and you would think Whole Foods would help support the neighbors with this," said Karen Michaels, who lives in the 1500 block of Melrose Street. After those residents said their voices weren't being heard in May, the West Lake View Neighbors postponed its vote until developers could address the concerns. They returned in July to unveil a vegetarian restaurant that eliminated much of the opposed brick wall and a park on Melrose Street. Still, traffic changes — specifically those caused by a parking lot entrance/exit on Melrose Street — left neighbors grumbling. The Melrose Street faction asked again for developers to consider eliminating it altogether or making Melrose Street end in a cul-de-sac to prevent a rush of traffic down the quiet street. But developer Chris Sotos told neighbors, "at some point, you need to be reasonable and fair and realize Belmont and Ashland is a commercial [intersection], and this is relatively lower-intense [traffic] use than other things. "Everything possible has been done for traffic flow and to make the neighborhood safe. Everyone's comments have been addressed as best we can," he added. The Chicago Department of Transportation approved changes to the traffic patterns on the block, agreeing to constrict Melrose Street to westbound traffic toward Ashland Avenue on the supermarket's north end. There will also be an added traffic signal at Melrose and Ashland with designated turn lanes with 100-second cycles. Most of Melrose will see a decrease in traffic due to the change, although the portion from the Whole Foods exit to Ashland will have more, said traffic consultant Luay Aboona, of Kenig, Lindgren, O'Hara, Aboona, Inc.
A cul-de-sac would hinder access to Melrose Street for emergency vehicles, an unsavory option with a nearby senior living facility, some said. Developers would also have to acquire at least three private properties, Sotos said. "Every time you take a street off the grid, there's a consequence. Traffic will just disperse to another street, which makes it someone else's problem," he said. If the proposed solutions don't adequately alleviate traffic and parking woes, alternative measures like speed bumps or 24/7 permit parking on the street could be proposed through a petition, said Bennett Lawson, 44th Ward chief of staff. Supporters spoke up during the meeting, including Lee Crandell, on behalf of the Lakeview Chamber of Commerce. Others said it was time for a better Whole Foods than the current store at Ashland and School. "I want it to change. I want it to be better. I find it challenging to find a spot, and I look forward to having a Whole Foods that is more open and conducive to parking at any time," said Sarah Zelken, who lives on Roscoe Street in the neighborhood. The issue drew about 30 new members to West Lake View Neighbors, which allows votes only from those who have paid dues within two weeks of a meeting. The group will meet again in September.